The North pole of the sun switched polarity in mid-2012 which seemed early at the time since solar maximum was not expected till the fall of 2013. It is difficult to imagine that there will not be consequences for the Earth but what those consequences might be is not a “settled science”. Certainly geomagnetic reversals on Earth have more to do with the flow patterns in the earth’s liquid core and have quite different time periods. The time span between geomagnetic reversals on the Earth vary between 0.1 and 1 million years with an average of 450,000 years. The latest one, the Brunhes–Matuyama reversal, occurred 780,000 years ago. However,a study published in 2012 by a group from the German Research Center for Geosciences suggests that a brief complete reversal occurred only 41,000 years ago during the last glacial period. The reversal lasted only about 440 years with the actual change of polarity lasting around 250 years. Abstract: This work shows statistical evidence for lunar nodal cycle influence on the low-frequency summer rainfall variability over the plains to the east of subtropical Andes, in South America, through long-term sea surface temperature (SST) variations induced by the nodal amplitude of diurnal tides over southwestern South Atlantic (SWSA). In years of strong (weak) diurnal tides, tide-induced diapycnal mixing makes SST cooler (warmer) together with low (high) air pressures in the surroundings of the Malvinas/Falklands Islands in the SWSA, possibly through mean tropospheric baroclinicity variations. As the low-level tropospheric circulation anomalies directly affect the interannual summer rainfall variability, such an influence can be extended to the bi-decadal variability present in the summer rainfall owing to the nodal modulation effect observed in the tropospheric circulation. The identification of the nodal periodicity in the summer rainfall variability is statistically robust. The lunar nodal cycle is not something that is very well known but it is another celestial cycle which is clearly not to be ignored. Naturally the IPCC takes no notice of solar cycles, planetary cycles or lunar cycles and all these are lumped into what could be considered “natural variability”. The lunar orbit is inclined by about 5 degrees on the ecliptic. The moon therefore can lie up to about 5 degrees north or south of the ecliptic. The ecliptic is the plane of the apparent path of the Sun on the celestial sphere, and is coplanar with both the orbit of the Earth around the Sun and the apparent orbit of the Sun around the Earth. The lunar nodes precess around the ecliptic, completing a revolution (called a draconitic or nodical period, the period of nutation) in 6793.5 days or 18.5996 years. The effects of the 18.6 year lunar nodal cycle on climate on tides and geological sediments and on weather and climate have long been of interest (though not apparently for the IPCC). Nanocycles Method is the English translation of the title of a book published in Russian by Professor of Geology S Afanasiev of Moscow University in 1991,ISBN 5–7045–0109–0. The lunar node cycle, which is presently 18.6 years, affects the rainfall on a 9.3 year cycle and this shows up as varying thickness layers of deposits, or varves, in geological formations. However the moon’s orbit is gradually getting larger over time and so its period is slowing down. The rate of movement of the nodes is also decelerating and Prof Afanasiev has determined the accurate nodal cycle period for the whole of the last 600 million years. 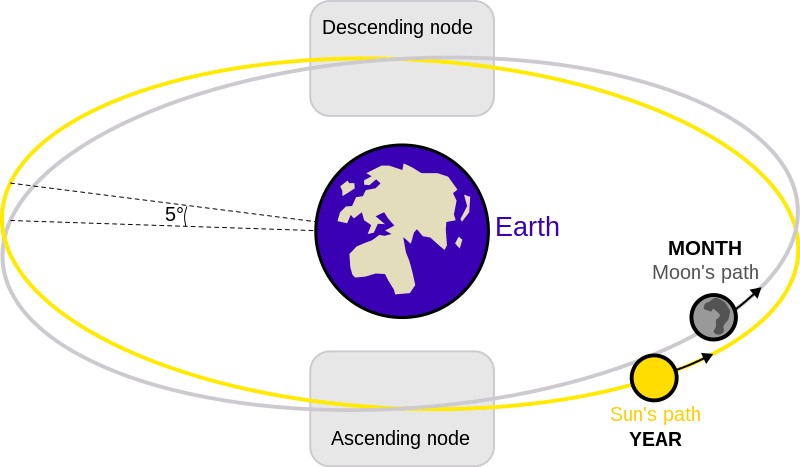 The cycle of the lunar node is important in affecting the weather because it plays a part in determining tides in the atmosphere, oceans and solid body of the earth. The atmospheric tides affect rainfall which in turn affects river flows and hence the deposition of geological varves, or annual deposits in geological layers. …..
At the present time, with a nodal cycle of 9.3 years, successive nodal cycles begin 0.3 years later in the seasons each cycle. Therefore after 3 or 4 cycles the nodal cycle start return to the same time of year again. The average period of the cycle when the nodal cycle comes at the same time of year is 9.3/0.3 or 31 years. Specific occurrences of nearly the same season, within 0.1 year, will occur after 28, 65 and 93 years and so on. …. Because the lunar nodal cycle period has changed from 9.147 years to 9.298 years in the last 1.0 million years, the secondary cycle has varied from 62.12 years to 31.21 years. If this cycle can be measured in a deposit to an accuracy of 1 year then it allows the dating of the deposit to an accuracy of +/-0.03 million years. The winds of climate are changing direction – again. Forty years ago “climate scientists” were sure we were entering a new ice age and even that we could have triggered the end of the current inter-glacial. For forty years we have seen the growth of the global warming meme and the demonisation of carbon dioxide and of all things “fossil”. A new economy based on the expensive and premature cessation of the use of fossil fuels took shape. All alternatives to fossil fuel – no matter how expensive or impractical – were worthy of subsidy. By invoking a connection to global warming any science project could attract funds. A fascist and authoritarian “environmental” politics gained ground. The politicians had a new “label” for introducing taxation in the name of controlling climate (!). Vast new revenue streams of taxes and subsidies and carbon credits were created in the name of protecting the planet. In fact the penalty for not being “politically correct” on climate was seen as being so disadvantageous that every product – from toothpaste to children’s toys to aircraft and weapons – had to show that it was “climate-smart”. Meaningless new parameters like “carbon footprint” entered the vocabulary. No self-respecting newspaper or scientist or politician or business could afford to be heretical with respect to the new religion of the day. But the Earth and the Sun and the resulting climate pay little attention to the puny efforts of man and dance to their own music. When an ice age is to come it will come and when the ice sheets are to retreat the earth will warm and humanity’s best option is to adapt to the changes as they come. If we understand anything about the Sun and its cycles, an ice age will surely come – whether in 10 or 10,000 years. And we should concentrate on having the wherewithal to cope when it does. To attempt to control the climate has more than a hint of arrogance. We might as well try to ask the Sun to shine a little less brightly or for a little longer! But for the last 17 years (or 12 or 18 depending upon how religious one is) global warming has stalled. Now vast amounts of a “new” fossil fuel – shale gas – have been discovered and its utilisation is changing the economic landscape. “Global warming” was renamed to be “climate change”. The money making (for some) revenue schemes and subsidy-milking for unnecessary and expensive renewable energy have been revealed for the scams they are. Heretical views are being expressed again. Could solar flare last week be linked to two major earthquakes yesterday? but I am not sure how strong the link to earthquakes is. The link between solar effects (radio flux, sunspots, magnetic reversals, proton events….) and volcano activity and earthquakes has been postulated and studied many times but if any such link does exist it is not something obvious and it is by unknown mechanisms. For some this search for such a link is not “science” and there is no link. For others it can be a lifetime’s quest. But “intuition” and “gut-feeling” keeps me believing that there must be a connection. It could well be that the build-up of stresses upto some “breaking point” within the earths crust are a result of ongoing geologic processes and do not need any external trigger like solar activity or the position of the planets to be unleashed. But even continental drift and the build-up of seismic or volcanic stresses are all – ultimately – driven by energy fluxes. And all energy fluxes on Earth can eventually be traced to the Sun (except perhaps if the energy is from any ongoing nuclear reactions in the Earth’s core). Although the sun is currently experiencing “solar maximum” — the culmination of its approximate 11-year cycle — scientists have noted that this particular maximum is a lot quieter than predicted. At this time, the sun should be bubbling with violent active regions, exhibiting sunspots, popping off flares and ejecting CMEs. But so far, the sun seems to be taking it relatively easy. This morning (at 0716 UT), active region (AR) 1719 erupted with an M-class flare. With a rating of M6.5, this event is the most energetic flare of 2013 (although it’s a lot less impressive than 2012′s X-class fireworks). What’s more, the site of the explosion unleashed a CME in our direction. A CME is a magnetic ‘bubble’ containing high-energy solar particles. When the CME hits Earth’s global magnetic field, it may align just right to generate a geomagnetic storm. Should this happen, we’ll be able to measure the extreme magnetic distortion of the magnetosphere and bright aurorae at high latitudes may result. Aurorae are caused when solar particles are injected into the polar regions via the Earth’s magnetic field — the particles then collide with atmospheric gases, generating a beautiful light display. Shortly after the M-class flare erupted, a weak solar energetic particle (SEP) event was detected. This “radiation storm” was the result of relativistic particles slamming into the Earth’s upper atmosphere originating from the flare site. Posted in Natural Disasters, Natural Phenomena, Solar science | Comments Off on Could solar flare last week be linked to two major earthquakes yesterday? Double peak in Solar Cycle 24? as in SC14 and in SC5? The NOAA/NASA Solar Cycle Prediction Panel is puzzled. They don’t know if we are reaching solar maximum or whether another little peak could be on its way which would shift solar maximum for SC24 to 2014 from 2013. And should we compare SC24 with SC14 or should it be SC5? But SC24 will still show the lowest sunspot activity for 100 years. I note that not only SC14 but even SC5 had a double peak – so my expectation remains that this Landscheidt Minimum may be comparable to the Dalton Minimum – though not perhaps to the Maunder Minimum. Landscheidt’s prediction is that this Minimum will last till 2060 so we can expect low sunspot activity for the next 4 sunspot cycles (till SC28). The Sc24 – SC5 comparison looks like a repeating pattern but it would be wrong to assume that the Sun cares about this and it will surely continue to keep us perplexed as it does its own thing. The Big Picture is persuasive – even if we don’t really know what the sun is upto and even less about how the Earth dances to the Sun’s music. Posted in Climate, Solar science | Comments Off on Double peak in Solar Cycle 24? as in SC14 and in SC5? Here at a latitude of 58.7057° N, the Sun is eagerly awaited every day and is sorely missed if it is obscured by clouds during our short days at this time of year. 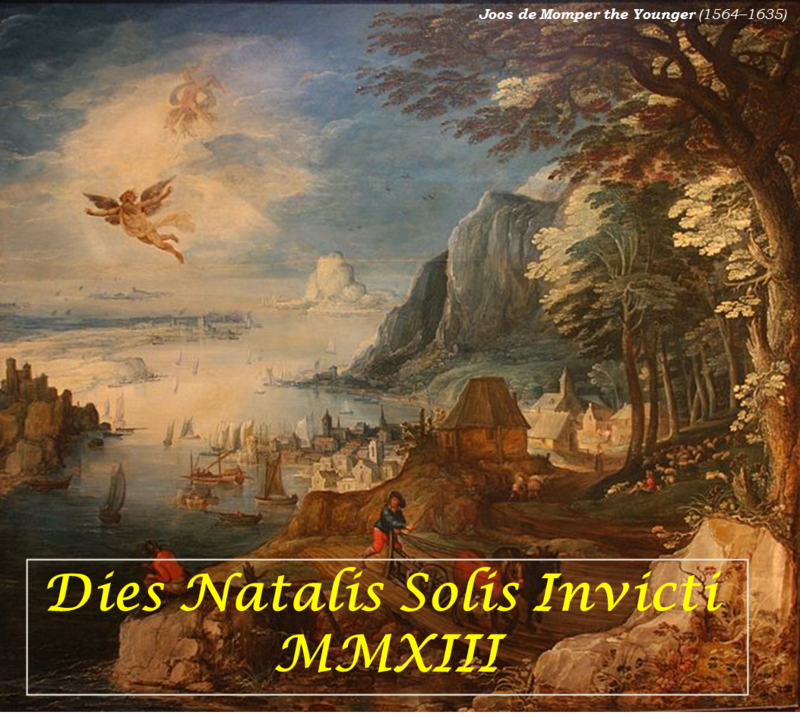 Sol Invictus is not a matter of faith or belief. It is a daily reality. The 21st of December was the shortest day of the year with sunrise at 0848 and sunset at 1503. But it has come and gone and the days are getting longer again. I can start my countdown to summer. It is not difficult to imagine how worship of the Sun must have started at least 20,000 years ago and perhaps as early as 100,000 years ago. In fact it seems obvious that our understanding of periodicity and the very concept of time must have started with what we observed of the Sun. The counting of days and the inevitability of the seasons and the development of a calendar all originate with the unfailing appearance of the Sun every day. Perhaps the periodicity of the daily Sun even accounts for humans developing the very notion of counting and numbers. And it is more than mere speculation to assume that even the great expansion of humanity from Africarabia around 100,000 years ago was to no little extent guided into directions defined relative to the rising or the setting of the Sun. One day – some 5 billion years hence – the Sun will have consumed all its hydrogen, will become a red giant and will swallow the earth. The earth will truly and inevitably die then. Over the following one billion years or so the Sun will be consuming its helium and become a white dwarf. And then the exhausted Sun – will cool and perhaps in 1000 billion years will be at the same temperature as that of surrounding space and will become a black dwarf – well and truly dead. Long before then, perhaps in about one billion years from now, the energy output of the Sun will rise by about 10% and there will be no water left in our atmosphere. As the Sun’s energy output increases further, our rivers and lakes and oceans will all boil dry and the earth will be finally devoid of water. If humanity is still present on earth when free water disappears then it too – with all other species on earth – will die. But humanity – along with many other Earthly species – may well have moved elsewhere by then. But for at least the next 0ne billion years we can continue to revel and bask in our invincible Sun. 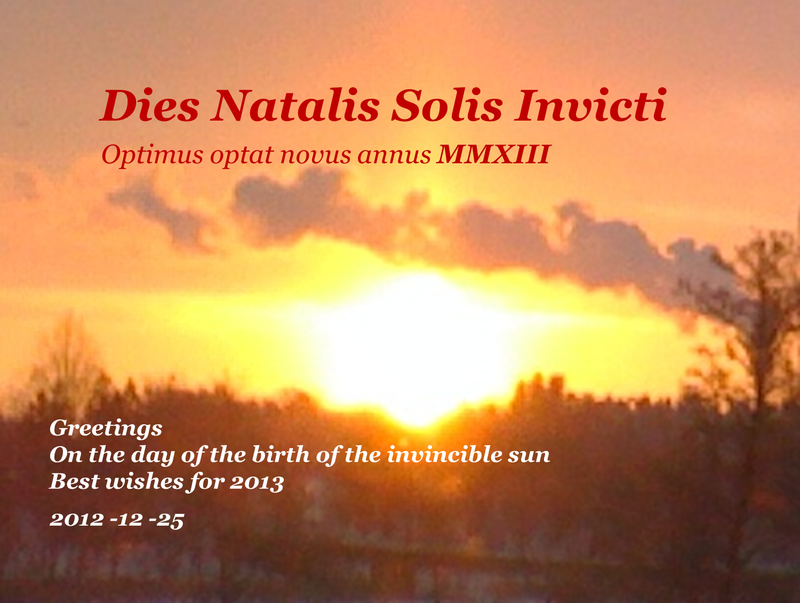 So, in celebration of the annual renewal to come I send my greetings to all in the name of the invincible Sun. (The picture this year is a blow-up of the banner for this blog and is of a sunrise, looking East, on a December morning in 2010). The shortest day of the year has come and gone and the countdown to summer (in the Northern Hemisphere) has begun. From a day length of 6 hours 15 minutes yesterday the next 183 days will see the length of the day – at this latitude – increasing by an average of over 3 minutes every day reaching a day length of almost 17 hours at the summer solstice. At 11:12 UT (6:12 a.m. EST), the world didn’t end (as far as I can tell), but it was a significant time none-the-less. That was the exact minute of the Winter Solstice in the Northern Hemisphere (or the Summer Solstice in the Southern Hemisphere) — when the daylight hours are shortest and the sun reaches its most southern position in the sky at noon. NASA Solar Dynamics Observatory (SDO) captured the time of solstice from orbit. Although the SDO is always imaging the sun through a multitude of filters, this is a great excuse to showcase the fantastic beauty of our nearest star, while putting all the doomsday nonsense behind us. The sun didn’t unleash a killer solar flare or devastating coronal mass ejection, but it is undergoing a fascinating period in its solar cycle. As can be seen from the SDO image above, the solar magnetic field is twisted and warped, channeling million-degree plasma high into the sun’s atmosphere in the form of beautiful coronal loops. This is all because the sun is fast approaching “solar maximum” — an exciting time when the sun’s magnetic field is most stressed. 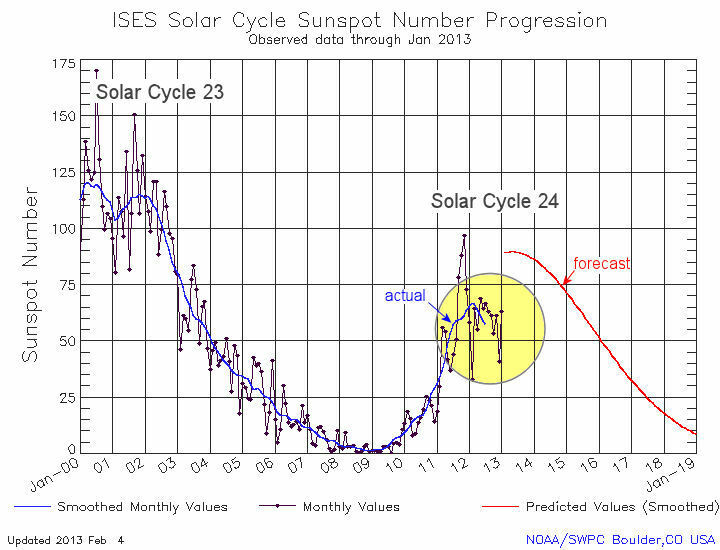 NASA has updated its forecast for Solar Cycle 24. Maximum is expected to be reached in Spring 2013 with a sunspot number of 60 and this prediction is for the lowest sunspot number in 100 years. This only confirms that we are currently in a solar minimum – the Landscheidt Minimum – though it remains to be seen whether this will be a Grand Minimum in the style of the Maunder Minimum or the Dalton Minimum. In any event a period of several decades of global cooling is to be expected and is already probably upon us (starting some 10 years ago).